Concentration Camps in the Dominican Republic? With mass deportations looming, Dominicans of Haitian descent live in constant fear of detainment. 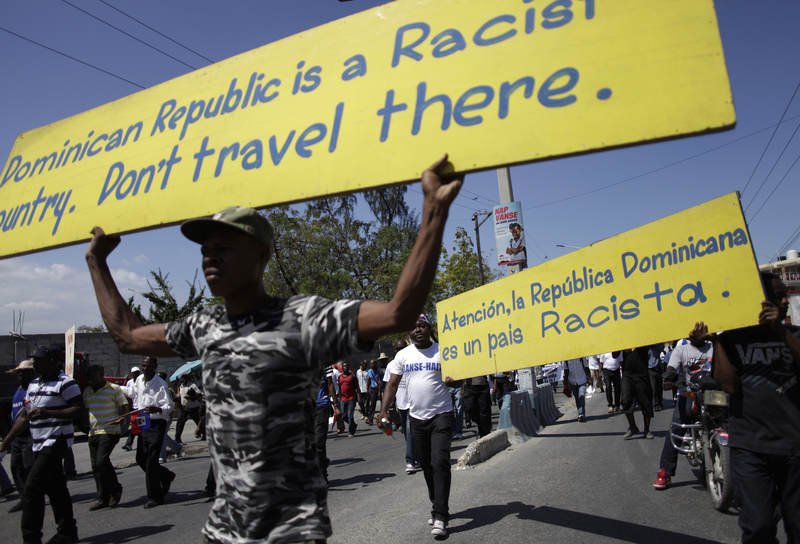 The Dominican Republic is sending mixed messages on deportation. But General Rubén Darío Paulino Sem, the army official in charge of the deportation, says the expulsion will start this Thursday, June 18. Sem has been overseeing the construction of seven concentration camps—which he calls “shelters,” or “centros de acogida”—where Dominicans suspected of being of Haitian descent will be housed until a “final evaluation” can be made. These two positions aren’t necessarily incompatible. Navarro could be talking about the final deportation to Haiti—which leaves room for the round-up to start next week, with the detained placed in Sem’s camps. In the meantime, the “path to citizenship” established by the DR in response to international pressure has been riddled with corruption, bribery, impossible bureaucratic hurdles, long lines, and pepper spray. I just left Santo Domingo two days ago where I urged Juan (name changed) to stand in the long line and attempt to register. He is defeated after having gone twice. He is one of the ‘lucky ones,’ as he has a copy of his birth record in San Cristobal. He was born in a hospital. His parents migrated to the Dominican Republic in the late 1980s and worked on a farm. The farm owner brought Juan’s mother to the hospital to give birth. At the time of birth, she gave the doctors her “latina” name. Many Haitians living on the DR adopt more Latin sounding first names and even surnames. As a result, Juan’s parents’ real names are not in the registry. Thus, his birth record is considered invalid and him stateless. He has attempted to register himself twice but says they only call in about 50 persons a day where the lines have thousands of people waiting. My partner’s sister called our home crying because she is scared. She quit her job as a cleaning lady out of fear that she will be detained on her way to or from work. Juan has resigned himself to just camp out in our house and get deliveries made from the local colmado (store). He says he’s fearful but powerless. I recently helped him acquire a Haitian birth certificate (he had to lie and state that he was born in Port au Prince) and he has applied for a Haitian passport. The Haitian embassy in DR told him he wouldn’t receive it until some time in September.